It’s my second posting as a Fresh Face Designer for Echo Park Paper Co., and I thought I would share a bit of a funny story with you! Click here to view this post on the Echo Park blog. I am not sure if any of you have ever had a craft project that seems like it is out to get you! Well, this week, I wanted to share with you a project of mine that is out to get me – but not in the way you might think! A colorful and bright wreath for my colorful little girls! This beautiful wreath, made with some simple paper cones, was designed to adorn the room of my two adorable daughters. And every day, as I walk in and out of their room, I inevitably catch the edge of this wreath on my shoulder! In fact, I am beginning to think that the only way it would be physically possible for me to run into this wreath as much as I do is if it was actually jumping off of the door and bumping into me as I walked past! I think the real problem is that the wreath knows how pretty it is, and just wants to make sure it gets noticed every time I come by. 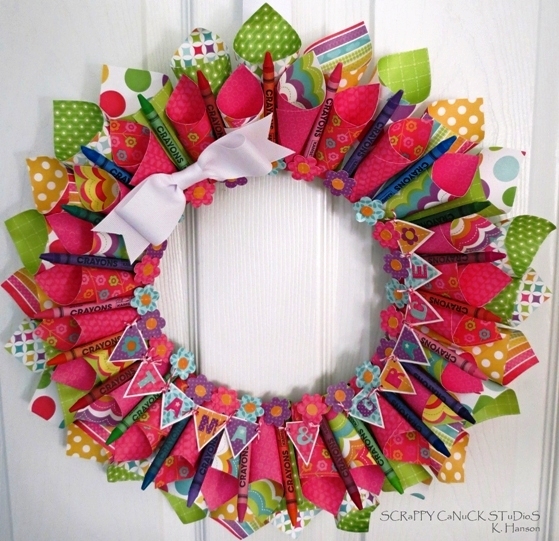 I love it – I really do, but who knew a little paper wreath could be so high maintenance! Actually, it really is no wonder that the vanity bug has bitten this wreath. You would be vain too if you were made with the amazingly bold and beautiful Summer Days collection by Echo Park. This paper just makes me smile every time I see it, and it was the perfect collection to use for my two daughters who happen to be just as bright and beautiful! And with some many amazing paper collections from Echo Park, this wreath could easily find a place in your home too (wouldn’t it be so cute with the new A Boy’s Life collection)! Just don’t say I didn’t warn you! Echo Park Summer Days collection – you will need 6-8 sheets of 12X12 paper to complete your wreath. To embellish the wreath, I added playful floral shapes (inspired by the Summer Days Element stickers) to the inside edge of the cones. This also helped to finish of the inside edge of the wreath and cover any gaps that formed as I was placing all of the cones. The banner shapes were cute freehand and adorned with letters from the Alpha Stickers sheet. 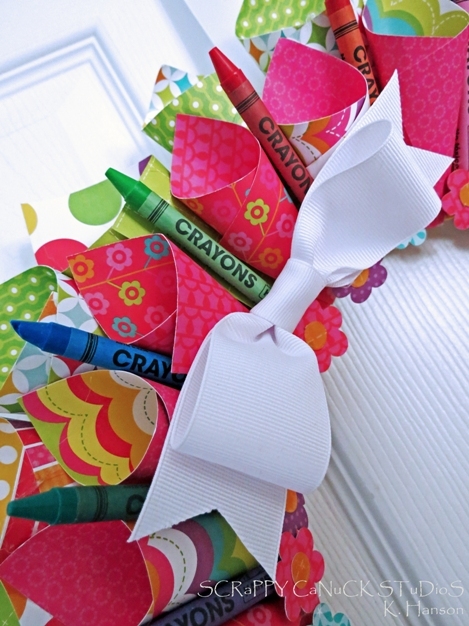 A simple bow and some colorful crayons help highlight this playful paper! So, even though I need to listen to the snickers of my husband as he hears yet another altercation between Karen and the wreath (I’m not sure if it is the banging of the wreath base or my cursing that gives it away), this bright and beautiful project is sure to be a part of family memories for years to come! This entry was posted in General crafts, Home Decor, Tutorials, Video Tutorials and tagged Echo Park, paper cone, summer days, tutorial, wreath by Scrappy Canuck. Bookmark the permalink. This is sooooo pretty! Love all the colours!! how cool is this!!! 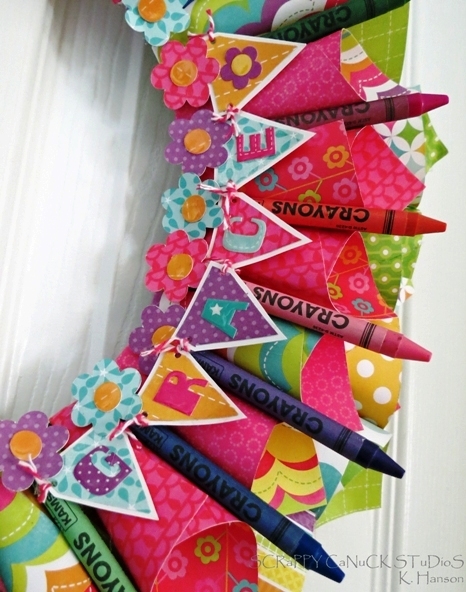 love the bright happy colors! Thanks Maria! I love that EP paper too! It was so hard to actually cut it and use it…but now I get to look at it all the time so it was well worth it! Wow, this is an amazing project. Very inventive. I love how you used the crayons. I love Echo Park and how you used it here. Fab! Hello, if you maybe would like to see I made a similar wreath nearly in the same time as you did (not as perfect as yours, I really really love the one you made).